Ashwagandha | Become Healthy or Extinct! 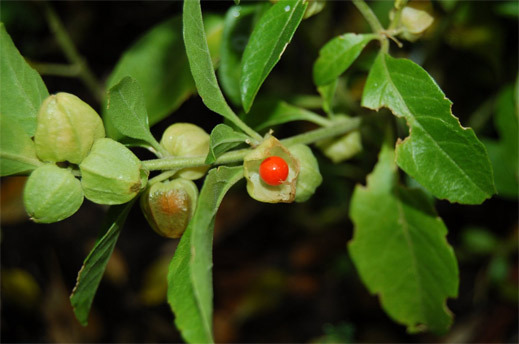 Ashwagandha, known commonly as withaniasomnifera, Indian ginseng, poison gooseberry, or winter cherry, is a plant in the Solanaceae or nightshade family. Several other species in the genus Withania are morphologically similar. It is used as an herb in Ayurvedic medicine. This species is a short, tender perennial shrub growing 35–75 cm (14–30 in) tall. Tomentose branches extend radially from a central stem. The flowers are small and green. The ripe fruit is orange-red. Ashwagandha contains many useful medicinal chemicals, including withanolides (steroidal lactones), alkaloids, choline, fatty acids, amino acids, and a variety of sugars. While the leaves and fruit have valuable therapeutic properties, the root of the Ashwagandha plant is the part most commonly used in Western herbal remedies. Ashwagandha is typically ingested in capsule form.